Jack's Restaurant, aka Jack's Rotisserie, 615 Sacramento Street between Kearny and Montgomery. Among its claims to fame: The Mimosa (champagne and orange juice) was invented at Jack's, and Robert Kennedy had one of his last meals here. Established in 1864, this was the place where the most powerful men in San Francisco rubbed elbows and secretaries for many decades. Notice the hooks inside - they're for hats - all along the inside wall. Private rooms were upstairs. 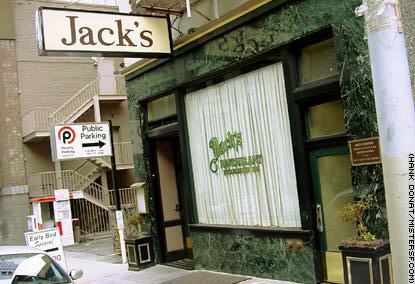 It's menu decidedly French, Jack's served its last order of creamed spinach in December, 2000.